If you’ve ever spent hours trying to get that perfect shine on your car, you’ll know just how painful it can be to repaint the body. By using an HVLP (High Volume, Low Pressure) paint sprayer, you can shave hours off work off DIY and professional projects. HVLP sprayers are ideal for providing a smooth, high quality finish that will make your car stand out from the rest. As a plus, not only will they save you money on paint, but according to Connecticut’s Department of Environmental Protection, they will also save the environment with a high transfer efficiency’. How to choose best automotive HVLP spray gun? Quality – How long are you going to use your paint sprayer for? Is it just for one or two projects, or will you be spraying all the furniture in the house? Deciding on the quality you require will lead you to the next question. Cost – With great quality comes great cost. If you are trying to find the best deal, I suggest you look at customer reviews online. These should help you decide if that too good to be true’ sprayer, actually does what it says it does. Reputation – Everyone who uses tools have their favorite brands. Personally I trust Rockler as a good all rounder. Not to expensive, but not going to break on the first try. Your needs – Make sure that the viscosity of the material you are spraying is supported by the chosen gun. Some HPLV sprayers do better with certain materials. It all depends on your personal needs. This depends on your price range. I’ve narrowed it down to Low (under $100), Medium ($100-200) and High (Over $300). Low I would suggest for those who have one or two projects every few months, such as painting a door or table. Medium would be consistent use on the weekends and larger projects such as an entire room. High price would be for contractors or those using the gun on a regular basis. What Are the Prices of HVLP Paint Sprayers? Anywhere from $50 to $1000, so you’ll have to find what suits your budget and project best. 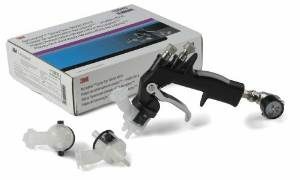 The TEKNA ProLite is a superior performance spray gun that features quality air caps as well as 1.2, 1.3 and 1.4 fluid tips. These air cups are made with an advanced fluid technology that ensures maximum atomization. They are packaged as a solution with several components enabling the painter to use it in changing environments. Moreover, it has high transfer efficiency that ensures material is saved. TEKNA is most suitable for solvent-based coatings and waterborne. It is protected for high corrosion resistance and contain non- stick properties. Graco-Sharpe Mini-HVLP FX1000 is a reliable spray gun that delivers high quality finish and unmatched spray pattern size. It features a wrench, FX1000gun, cleaning brush and 125cc cup. It can make large pattern sizes of about 9 inches. It’s fan and needle controls are tight enabling ease of use. The spray gun comes equipped with a high quality stainless steel cup that can be used with acetone based cleaning agents without causing corrosion. It comes in a compact design and is light weight. The 3M™ Accuspray™ System is a High-Volume Low Pressure spray gun that features disposable atomizing nozzles that make it as effective as a new primer spay gun. When using this gun you will not need to worry about overspray as the gun leaves a clean place and saves on materials. The spray gun can deliver a wide variety of spray patterns. It can be used for numerous applications including woodworking, refinishing, furniture, industrial, sign shops cabinet making and architectural. They are known to deliver a higher quality finish than other spray guns. It saves on time and materials. 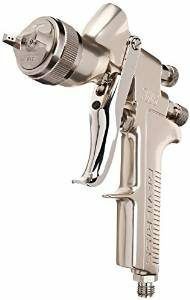 TCP Global® Brand HVLP is a high performance HVLP spray gun that is made of high quality and durable stainless steel material. The spray gun features excellent knobs for easy adjustment over your spray pattern. The easy adjustment also enhances fluid control as well as air pressure. The spray gun comes with nozzle sets. They are equipped with standard size ¼ Air Inlets. 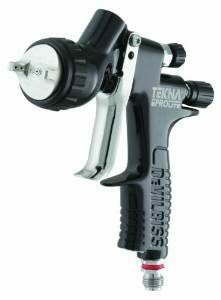 It is one of the most effective spray guns with an incredible operating pressure of about 29- 50PSI. TCP Global Brand Spray gun is designed to deliver diverse spray patterns without compromising on the quality of the spray. It features a 2.5 mm fluid tip that can be used in spraying thick materials such as Polyester Primers, Thick enamels, Chip guard, latex paints, gel coats and Extreme High Build. It also comes equipped with an Air regulator and I Liter Aluminum cup. It features control knobs that provide full adjustment over a spray pattern. The gun’s baffle head assembly is designed to deliver atomized and consistent spray pattern giving your work that elegant professional finish. Devilbiss Finishline 4 FLG-670 is a new and enhanced automotive spray gun that offers maximum automation delivering soft uniform patterns. It is made of high grade and durable stainless steel that is resistant. It also has an in-built air adjusting valve with a gauge for accuracy. 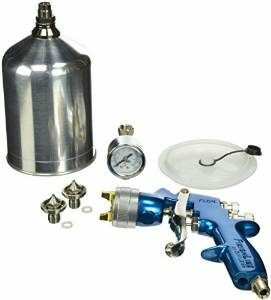 The spray gun has a high level of precision that most spray guns due to its machined air caps. Its high quality fluid nozzles ensure an excellent finish. The internal passages of the gun are anodized making it easy to clean. DeVilbiss 802343 is an auto painting and priming system that enables you to effectively spray full spectrum of coatings for a wide range of project sizes. 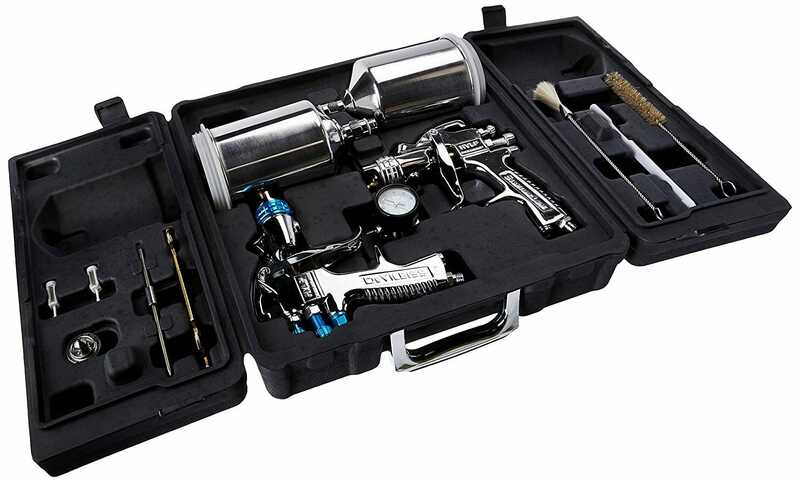 The spray gun is fully equipped with maintenance wrench, air regulator with gauge, carrying case, gun blow-molded storage and gun cleaning brush set. The spray gun is most suitable for a craftsman or handyman. The 1.3mm can be used atomization of clear coats, base coats and light viscosity coatings. The 1.5mm is set up for sealers, single stage, medium viscosity coatings and primers. The 1.8mm is ideal for atomization of sealers, primers, medium and heavy viscosity settings, thinned latex. 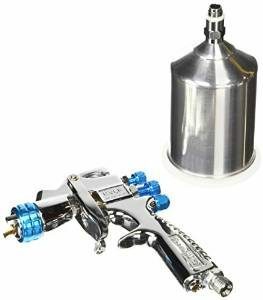 DeVilbiss 802405 StartingLine HVLP is a high performance spray gun that enables fine details and quality finish. The spray gun is not only easy to maintain but also comes with a maintenance wrench and a cleaning brush. It features a 1.0mm fluid tip that can be used to spray a wide range of materials. The 1.0 set-up is also excellent for sports repairs by employing different coatings. DeVilbiss 802405 produces high quality results and is sold at a low price. DeVilbiss Plus GFG670 is a high technology spray gun that delivers powerful automation and high energy than other spray guns. It has about twice the energy of HVLP guns. The high automation produced by the spray gun makes it easy to spray high-solids clear coats producing an exceptional glass-like finish. It has high fluid flow making the painting job fast and easy without compromising on the quality of the result. The ozone-friendly technology used in making the spray is approved by SCAQMD. The gun is dish washer safe. It has a large 32oz aluminum cup eliminating the need for frequent refills. The spray gun is fast and easy to use. 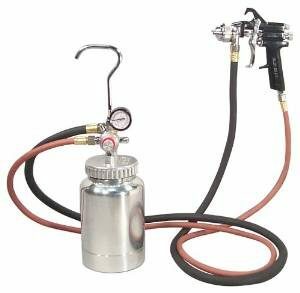 The Astro Pneumatic 2PG7S 2 Quart spray gun features a pressure cup, 6ft fluid hose, 6 feet air hose and a spray gun. The fluid pressure and pressure gauge regulators ensure that a user makes accurate settings easily. You can mix both mix and paint about 2 quarts at the same time. The 6 Ft hose permits twin set is specifically designed to enhance operation and movement of the spray gun making it extremely easy to use. 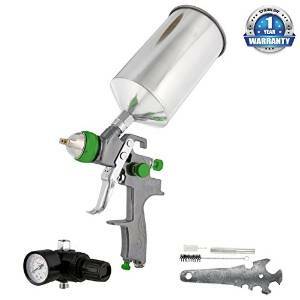 This spray gun is most suitable for spraying trucks, vans and buses among other large areas. What is a HVLP Paint Sprayer? An HVLP Paint Sprayer, sprays paint using compressed air to get an even finish. The tool typically comes in two parts, a compressor and the spray gun’s main body. The compressor is connected to the gun via a flexible rubber pipe and forces highly compressed air through the through to the spray gun. The spray gun is attached to a to a paint can, and the paint is then sprayed out at a low pressure. The HV (High volume of air) is responsible for the flow and direction of the paint while the LP (lower air pressure) reduces the atomization of the paint sprayed out. The low pressure is the advantage to this particular type of spray gun as it allows for good, even coverage of surface areas. Many choose this type of spray gun as it reduces air pollution, paint wastage and reduces overspray. HPVL paint sprayers like most things, can be expensive or cheap. The cheap kind usually results in many plastic components, making it light and maneuverable, but easily breakable. The more expensive options are tougher and long lasting, but are only necessary for heavy or regular users. Even though both professionals and amatuers love this type of sprayer, it comes with a few cons. Very few cons. The benefits far outway the negatives, making this type of sprayer my personal favorite. Due to the low pressure, this type of paint sprayer is a little on the slow side. I wouldn’t use it for a large outside wall for example. But inside the home, the reduction in mess and accidental spray is so little, it may be worth the faster clean up time. HVLP is not great when working with thick paint of a high viscosity. It’s not much of a problem if you are using the right paint though. Due to the low pressure, you could reduce your paint consumption anywhere from 50% to 80%, a massive saving. If you’ve found yourself inhaling massive amounts of paint during your projects, you’ll be happy to know that there is a solution. HVLP sprayers were designed to minimize air pollution, and keep the paint where it belongs; in the can or on the wall. When the pressure of a paint sprayer is too high, the paint will naturally bounce off the wall and onto you, your car, and probably the tree outside. When I started using these sprayers, I was relieved to have such a pleasant clean up. 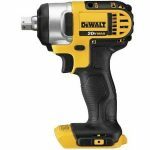 Due to their application accuracy,, these guns are easy to control for delicate projects. They are maneuverable and precise. Easy to setup, easy to disassemble and quick to clean. Relatively painless in comparison to other sprayers. All manufacturers provide clear, simple instructions that even a novice can follow. HVLP vs LVLP, which is better? The difference between the two is minimal, and I would suggest taking into consideration what your project is. If you have to spray a large surface for example, I’d suggest an HVLP. But if you wanted to get the finest, lightest spray possible for a delicate project, LVLP is the way to go. How Do I Use an HVLP paint sprayer? Each paint sprayer differs slightly, as all are manufactured by different companies. Refer to the instructions provided with your device to get the most optimal performance out of it. There are a few basics steps that will stay the same. It’s so important to mask your painting area up. Cover important areas with plastic or old newspapers to ensure they will not get dirty. Even though the HVLP is not as messy as traditional sprayers, covering up is still necessary for any paint job. Don’t forget to place some newspaper on the floor too! Make sure not to overfill the cup, if you need more coverage than what the cup allows, you can always refill it. After filling, reattach the cup lid. This will prevent fluid needle movement. This will fully open the valve allowing paint to go through the system. The inlet pressure depends on your gun and application. You should be able to find this information included with your gun. 7. Turn the fluid adjusting knob counterclockwise. Stop when the first thread shows. Do a little test spray on a piece of newspaper or random surface to test it out. If the finish is too dry, reduce the airflow by reducing inlet pressure. If the finish is too wet, reduce the fluid flow by turning the fluid adjusting knob. If the atomization is too fine, reduce inlet pressure, increase inlet pressure if it’s to coarse. The pattern size can be adjusted by turning the the spreader valve adjustment knob clockwise. I can’t stress enough how important this step it. If you don’t test your application, your entire spray could be messed up. Arcing or tilting could result in an uneven and thus undesirable coating. The recommended spray distance is 150-200mm or 6 – 8 inches. 3. Spray the edges first. With a smooth motion, spray the edges with a minimum overlap of 75%. Make sure you move the gun at a constant speed and don’t spray to much on one area. 1. Turn off the air supply. Make sure you always turn off the air supply and relieve the pressure when the gun in not in used. Always clean your sprayer immediately when you are finished. This will increase the life of your tool and ensure you always get a smooth finish. Note: The HVLP sprayer is a tool and can be dangerous in the wrong hands. Make sure no small children get their hands on it, or are in the vicinity without a spray mask when you are painting. Paint products can be dangerous when inhaled, so be careful. Always turn off the the air supply and relieve the pressure of the sprayer when you are not using it. This includes when you take a break to wait for a coat to dry. 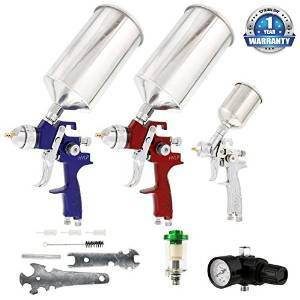 Spray Gun vs Spray Gun System – What Is the Difference? A common misunderstanding, a spray gun of any kind, will use a specific spray gun system. There are several types of spray gun systems, HVLP for example, is one of them. It is up to you to decide which type of system will suit your project best. LVLP is another type of spray gun system. You can choose to have either turbine or compressor powered systems. Personally I always go for turbine as it’s more convenient. Apart from the pros already mentioned above, there are a few other features of an HPLV sprayer. Most sprayers feature low-wattage motors, various aircap sets, and turbine motors. Features on HVLP systems should not distract you from the core functionality, as this is what will provide that mirror, perfect finish. Different brands will offer different features, for example Fuji Spray offers a sprayer with non-Bleed functions and a Fan Control Knob to adjust pattern size from small circular to wide. 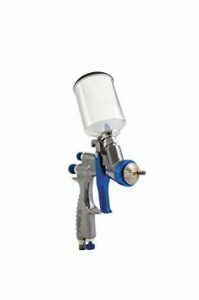 Campbell on the other hand offers the Hausfeld HV2002 HVLP Turbine Paint Sprayer, which can handle paints of differing viscosity. A turbine HVLP system is a self contained, independent spray system. The system utilizes a turbine to generate air pressure required for the spray gun to atomize the paint. The air from the turbine is transferred via a flexible rubber hose connected to the paint area. A HVLP system that uses a compressor is much bigger than the turbine version, as it requires an actual separate compressor. There are various sizes of compressors for different spray guns with specific applications. I personally enjoy using a turbine HVLP as the whole machine is much smaller and maneuverable. It’s easy to use it anywhere, and doesn’t require much effort to move. They also have the benefit of being significantly cheaper than the compressor versions, sometimes by as much as 50%. A compressor would be useful to a professional who has a dedicated workspace and does not need to move around much. 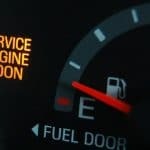 Although the initial price of a compressor might be high, the lifetime is significantly longer. The compressor may also be used for multiple sprayers or other jobs if it is large enough. If you buy a turbine system, there is no need for extra equipment. If you purchase a system that requires a compressor, there is a chance that you will need to buy that compressor separately.